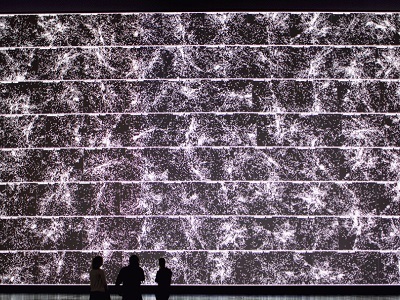 Japanese artist Ryoji Ikeda will present two large scale audio-visual installations at the Carriageworks this July. The Australian premiere of the installations by Ryoji Ikeda, an electronic composer and visual artist will be held at the Redfern-based multi-arts institution from July 5 until July 29. Titled micro | macro, the free exhibition explores the intersection of art and quantum physics. Ikeda developed these artworks during a residency at Switzerland’s CERN, the European Organisation for Nuclear Research. One of the few international artists working convincingly across both visual and sonic media, Ikeda, whose work is characterised by mathematical precision, elaborately orchestrates sound, visuals, materials, physical phenomena and mathematical notions into immersive live performances and installations. The first of the two installations being exhibited at the Carriageworks has a theatrical context and covers 172.8sqm of exhibition space. Titled ‘the planck universe [micro]’, the artwork explores the building blocks of matter and is a representation of nature that is infinitesimally small, brought to human scale by enlarging it by a measure of 10-35m. ‘The planck universe [macro]’, the second installation in the exhibition features an immense wall projection measuring over 10m in height, which seeks to depict nature, scanned from human scale to the cosmological scale beyond our observable universe.